I’m having the time of my life! Researching Canadian pottery has been a hobby of mine for many years. I’m a collector and researcher and I’ve amassed an extensive diverse collection of Canadian manufactured pottery. I especially enjoy doing research on the history of the potteries – the people, the places, the pieces – and how all parts fit together to provide a picture of the material culture history of Canada. As a beginner collector of Canadian pottery, I found that there was no consistent information available to help identify what I held in my hand. 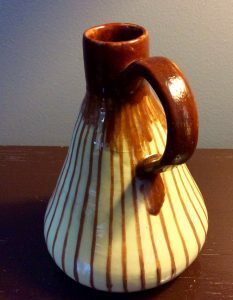 The larger, better known potteries, like Blue Mountain Pottery and Medalta pottery have excellent collector’s clubs and websites that provide information about that pottery. It was the smaller, less known, potteries where I was often stumped for information. This led to the creation of spreadsheets and files, and finally to the idea of creating a website where the information can be shared with others – from the beginner collector, to the researcher, to the artist. I will be sharing information gathered from many places – snippets of info here and bits of info there. Check out the ‘Additional Resources’ page, when ready, for research sources. Where possible on this website, I will link information to its original source. Where it is not, I will give credit to the source. The photos are my own and are certainly not professional quality. However, I hope they provide details on materials, like clay types, glazes, and identifying marks. So, this website is certainly under construction now, and will most likely be ‘Under Construction’ for many years to come as information and research sheds new light on Canadian pottery. Please feel free to contact me if you have anything you’d like to add to this ‘research’ process. If you wish to reuse the information on these pages, feel free to do so, but credit the ‘original’ source. NOTE: I do not provide appraisals or evaluations through this website, nor do I sell pottery here. When pottery pieces are for sale, a link will be provided to the store. All content is for information purposes only. Would Greatly appreciate any info on this beautiful piece. 6.25 inches x 4. Marked “Lake Jacques Canada”. Found in a thrift store in Montreal.